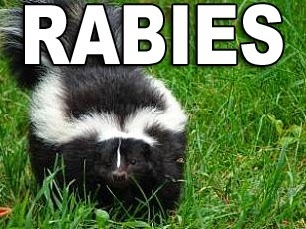 A skunk collected from the 200 block of Odessa Avenue in Galloway has been confirmed as the seventh case of rabies in Atlantic County this year, but the first found in Galloway. This is the second rabies case found in a skunk. The other previous cases involved four raccoons and one fox. The skunk was found in the property owner’s yard and exhibited aggressive behavior before it crossed the street into another property where it was captured and removed by the local animal control officer. It was sent to the state lab for testing where it was confirmed positive for the viral disease on August 28, 2014. An investigation by the Division of Public Health has determined that there were no human exposures. Public Health Officer Patricia Diamond strongly encourages residents to vaccinate their pets to protect them from the potentially deadly virus as well as to provide a barrier to human exposure. Residents are also advised to avoid contact with wildlife as another protective measure. The Atlantic County Animal Shelter provides a free rabies vaccination clinic each month for dogs and cats. The next clinic will be held on Sunday, September 21 from 9 AM to 11 AM at 240 Old Turnpike Road in Pleasantville. Dogs must be brought on leashes and cats in carriers. For more information call (609) 485-2345 or visit www.aclink.org/animalshelter. To learn more about rabies and how to protect your pets and family members, visit www.aclink.org/publichealth.